When should I flush my system? A system should be flushed when repairs are being done and the system is opened to the air. However, if a “closed system” retrofit is being performed and the system is not opened, no flushing is required to remove contaminants. What is a POE-based flush? A POE (or polyol ester)-based flush is a safer, more effective A/C system flush than the more common Terpene-based or solvent flush. POE based flushes have a higher flash point, no offensive odor, and will not harm system components. Any trace that is left behind is compatible with the air conditioner’s component parts, POE or PAG lubricant, and is miscible with R-134a refrigerant. What is the proper procedure for flushing? Most OEMs do not recommend flushing procedures. There are many components that cannot be flushed, such as the compressor, receiver/drier, expansion device and, in many cases, the condenser. 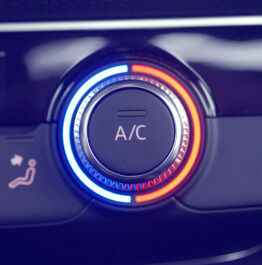 We recommend that you seek professional help when attempting to flush an A/C system.